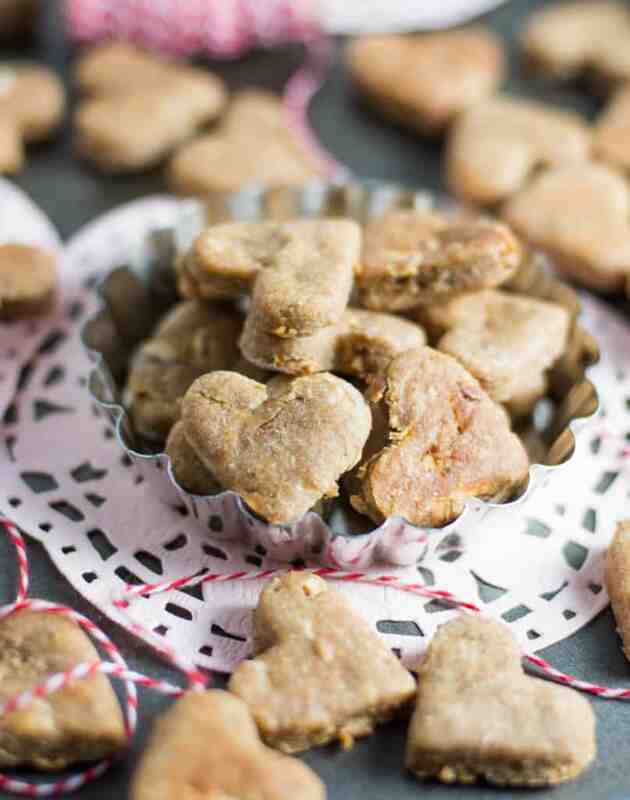 Homemade apple peanut butter dog treats are a healthy way to say “I love you” to your four-legged friends and family. It’s closing in on a FULL year since Cookie become my forever puppy, so I wanted to make her first Valentine’s Day with a mom something special. 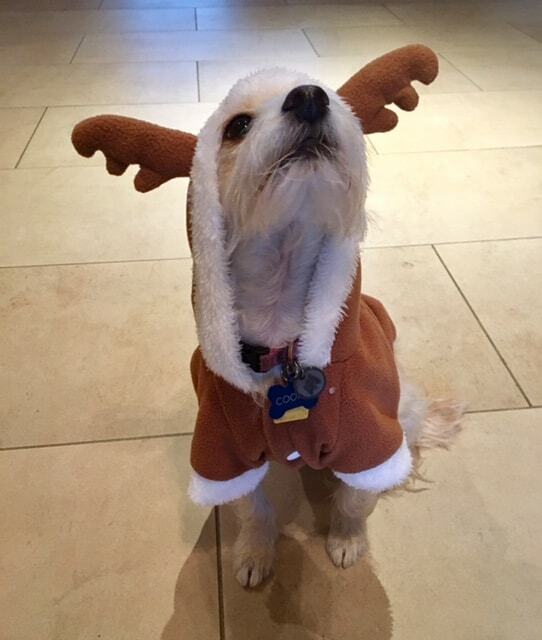 I mean, just look at my baby in her reindeer costume at Christmas! She was so freaking cute in her little outfit that I forced her to wear it for a week straight, and in that time she didn’t complain or try to chew it off of herself even once. I started calling her the littlest reindeer and made up a story about a tiny dog from Mexico who didn’t have a home so she ran and she ran and she ran, finally ending up at the North Pole and becoming the littlest reindeer. If she tired of hearing me talk about reindeer from Mexico, she never let me know it. She’s sweet like that. In the time I’ve known my little Cookers, she been the recipient of more belly rubs than I can count, gotten over her extreme fear of sprinklers (for the most part), and developed a love for peanut butter, which she didn’t like at all when I first brought her home. She now has a deep and abiding love for the stuff just like her mom does, to the point that she practically wags her tail off of her body whenever I pull the peanut butter jar out of the fridge. Seriously, it’s so cute. Naturally, peanut butter dog treats were in order. And because Cookie also loves apple I thought apple peanut butter dog treats were the perfect thing for her. And guys, I don’t claim to be an expert, but I think these are pretty healthy. With apples, natural peanut butter, flax, water, and flour being the only ingredients, they’re something I don’t feel guilty giving my darling little reindeer. I even packaged some up, tied a little bow on top, and gave them to my neighbors for their dogs. On a side note, it weird that I don’t know my human neighbors’ names but I know all of their dogs by name? Maybe. A note about the recipe: I realized as these were baking that I don’t have any way to determine if the recipe needs tweaking for better flavor. I ate one after it baked and it was disgusting. Exactly as disgusting as a cookie would be when whole wheat flour is its predominant ingredient. But Cookie gobbled them down so they must be fine for the canine palate. I tried to get a picture of her eating one but she’s so wiggly they all came out blurry. This is her just after finishing one. 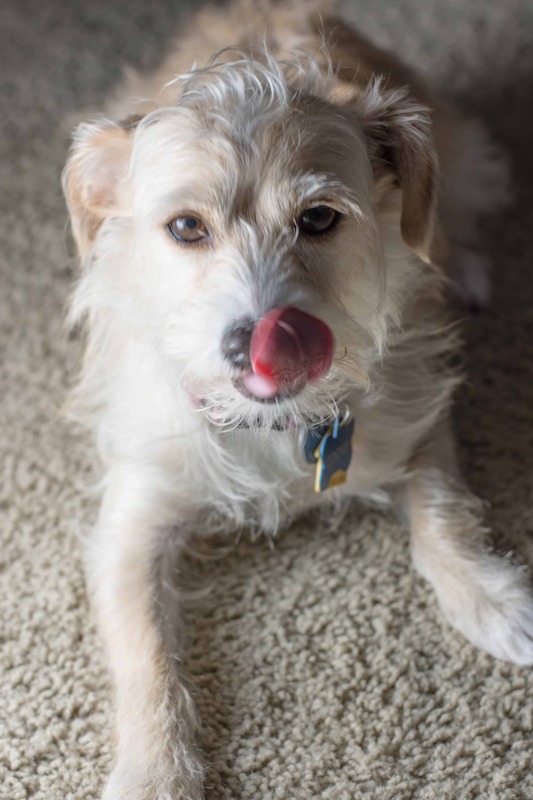 Lip-licking means peanut butter dog treats are where it’s at. 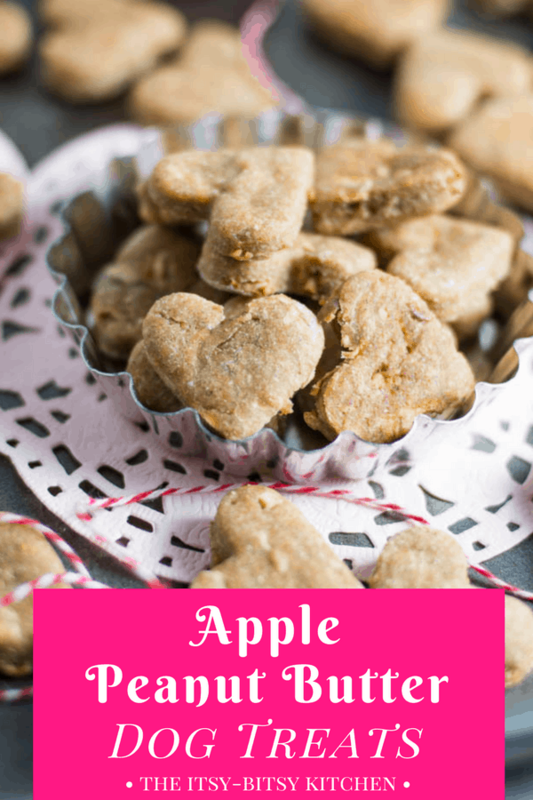 Apple peanut butter dog treats are a fun homemade treat for all your furry friends! Place the grated apple onto a layer of paper towels and squeeze most of the liquid out of it. Set apple aside. Combine the flours and ground flax in a medium mixing bowl. Add the water and peanut butter, stirring until combined—the dough will be pretty dry so I recommend mixing with your hands instead of a spoon or spatula. Mix in the grated and squeezed-dry apple until evenly distributed. If it’s too dry add a bit more water; if it’s too wet add a bit more whole wheat flour. Knead until the dough becomes a cohesive mass. Roll dough out to 1/4-inch thickness on a lightly floured work surface. 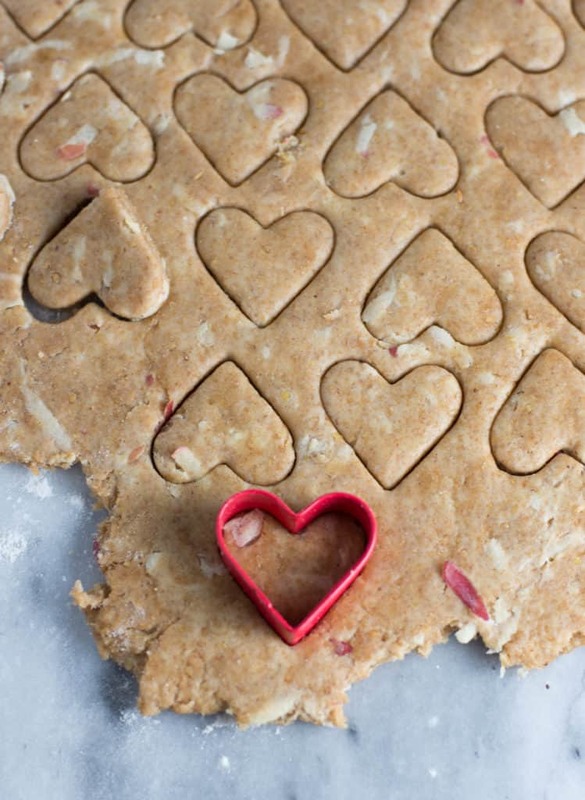 Cut into 1-inch hearts (or other shapes) and bake 26 to 30 minutes, until treats are light golden brown. (Larger cookies will take longer to bake, smaller ones will take less time so adjust baking time accordingly.) Remove from the oven and allow to cool completely before serving or storing in an airtight container. 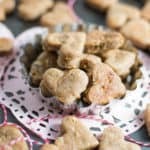 My dogs love these — even the one who isn’t fond of peanut butter. Thanks for posting! These treats look so good that *I* almost want to snag a few! What a sweet tribute to Cookie. I did a double take when I first read her name because that was my childhood dog’s name too! And I’m pretty sure it’s the normal progression to learn your neighbors’ dogs’ names several months before learning theirs. At least, that’s how it seems to go for us! Hi Caitlyn! 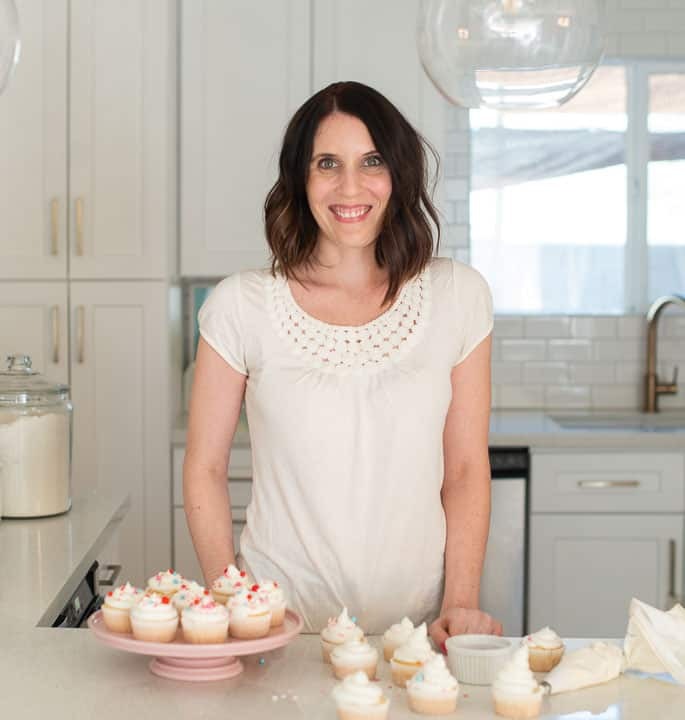 You can substitute regular old all-purpose flour. I hear you on having WAY TOO MANY kinds of flour lying around!